RUSH: I checked the email during the break. An interesting question: “Rush, you haven’t talked about the second indictments that have been handed down against Paul Manafort,” and I’m paraphrasing the email. The question basically is these things still have nothing to do with even the campaign. Everything Manafort’s being indicted for happened before the campaign, and then a letter writer very astutely mentioned that Mueller is changing the venue from Washington, D.C., to the Eastern District of Virginia, which is where Manafort lives. While that is an interesting aspect of this, the email says, “What is going on?” Folks, let me just remind you again. I’ve kind of been on this high horse for the past two or three days, but nothing has changed. Just because it’s not in the news every day because it has not been the focus of the Drive-By Media each and every day, the Mueller investigation remains with one purpose, and that is to destroy — get rid of — Donald Trump. However they can manage it, that’s the purpose, and no matter what is reported day in and day out about the progress, that objective has not changed. There hasn’t been any laziness that has swept in. There hasn’t been any loss of emotion or energy on the part of the prosecutors, investigators. The objective is still to get rid of Donald Trump, and the mechanism for doing this — their best bet — is for the Democrats to win the ’18 midterms in the House and then impeach Trump with whatever case and evidence is presented by Mueller. That hasn’t changed. The focus of the investigation hasn’t changed. The investigation is not looking at Hillary Clinton. It’s not looking at Fusion GPS. There has been ample opportunity to indict or charge Hillary Clinton. These people have had two or three chances since 2016, and they pass every one of them. I get email from people that suggest, “You know, Rush, I think you’re missing the point here. I think Mueller’s being very crafty. I think Mueller is actually building a case against Hillary and is gonna be shocking everybody when she and Steele end up being indicted,” and that’s a wonderful wish list. But, my friends, I honestly have to chuckle, because Hillary’s been exonerated. It happened on July 5th, 2016. She been exonerated on her email stuff by order of Barack Obama. When Obama publicly says, as he did, “She didn’t do anything wrong! She didn’t intend to do anything wrong and she didn’t do anything wrong,” Obama was ordering his minions in the media to let her go. They’ve had I don’t know how many opportunities to lower the boom on her, and to think that there’s some secret element of the investigation where that’s gonna happen? Sadly, it’s wishful thinking. What is happening? Why the additional indictments on Manafort, and why now the guilty plea from Rick Gates? Well I, of course, don’t know. But using my intelligence guided by experience — coupled my unwavering opinion of what this whole objective is — I think that Mueller is doing everything he can to pressure Manafort into saying that he either saw collusion or saw obstruction. Mueller needs a witness. To date, there has been no leak confirming any evidence of collusion exists because it didn’t happen. Well, you would think. But in something like this, believe me, it can be structured. I’m just trying to tell you that the objective here hasn’t changed, and just because you don’t see as much news coverage on it, it doesn’t mean that the investigation’s petering out. It doesn’t mean that it’s about to end ’cause they’ve looked everywhere they can and haven’t found anything. The objective is to get rid of Donald Trump. It has not changed and it will not change. RUSH: So Rick Gates, the so-called former Trump campaign aide, who has been indicted along with Paul Manafort, has decided to plead guilty. And he sent his family a big, long letter explaining why. The letter has been publicized, and he essentially says that public humiliation is a small price to pay for family angst and disaster. Here is the letter that was so-called “obtained” by ABC News. Rick Gates is 45 years old. You never heard of him until this happened. He was a minor bit player. I’m not saying that he and Manafort are innocent. Don’t understand. I have no way of knowing. All I know is the things that they’re accused of doing have nothing to with the Trump campaign. They all happened before Trump even decided to run for the presidency. All I know is that Trump is the target. He’s always been the target. He remains the target. There is no other target. Trump is it. A good friend sent a note, “Rush, you gotta know they’ve gotta have the dirt on so many Democrats here. “You look Christopher Steele. You look at Hillary and Debbie ‘Blabbermouth’ Schultz and all the stuff that went on the DNC, and then you’ve got the Podestas and so forth.” I will be shocked if a single Democrat is ever discovered to be investigated in this investigation. I will be shocked. I guess it may be. It may be that some obscure, low-level Democrat somewhere might get indicted for something in this so that the investigation can demonstrate its bipartisan nature. But anyway, here’s Gates’ letter to his family. It’s part of it. He’s 45 years old. His family’s young. He wrote to family and friends “despite my initial desire to vigorously defend myself, I have had a change of heart. … The reality of how long this legal process will likely take, the cost, and the circus-like atmosphere of an anticipated trial are too much. I will better serve my family moving forward by exiting this process.” It’s essentially the same thing Michael Flynn did. Gates will run out of money. His children’s future will run out of money. He will not be able to continue his defense if he decided to go down that path, and so the lesser of two options is to take the plea, go to jail, suffer the humiliation. But have a day down the road where he gets out of jail, still has some semblance of a financial base with which to perhaps begin to rebuild a life. But in this case, and particularly Manafort — just to repeat — the objective here is to get these guys to flip. It’s called “flipping,” and they’re really being pressured. Manafort is really being pressured. They become friends, kind of like the Stockholm Syndrome with a kidnapping victim. “It doesn’t have to be this way, Paul. You just have to unburden yourself. You just have to tell us what you and I already know, Paul. You just have to confirm to us that the campaign was working with Russia. 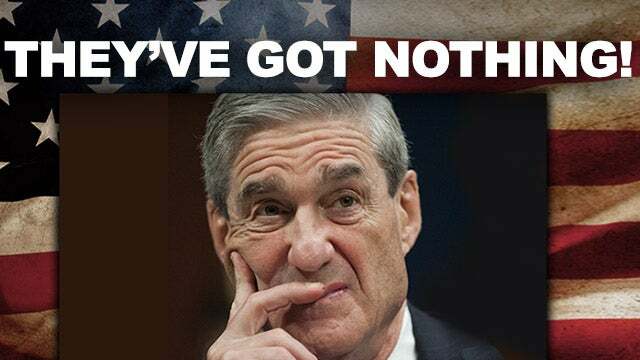 You just have to say it,” or alternatively, “Paul, you just have to tell us what you know about how the president was trying to shut us down, obstruct justice.” Mueller needs a witness, ’cause there isn’t any evidence. “Of course there isn’t a prosecutor in the world that would take false evidence and try to pass it off as real!” I used to think that. I used to. I used to instinctively believe that. But I know that this is a political counterterrorism investigation that’s being made to look like a criminal investigation, and I have learned that it is perfectly fine for prosecutors and cops to lie to suspects in pursuit of a confession. So they desperately want Trump, and they have who knows? Endless amounts of money and the full force power and pressure of the massive federal government behind them. And what’s telling is that there isn’t any evidence yet. There won’t be any real evidence ’cause Trump didn’t collude. That all happened on the Democrat side. That’s what nation doubly outrageous.